We use the spring tension of the band to simulate reformer machine exercises. This extra resistance can help to tone peripheral muscles, optimise flexibility and improve joint mobility. Our weights are only 1 kg dumbbells and we use them not to build bulk but similar to the theraband, the extra resistance will help to tone peripheral muscle and achieve a more effective stretch. The Swiss Ball was originally used in the 1960’s by Swiss physical therapists to help children with cerebral palsy improve their balance, reflexes and strength. Combining Pilates techniques with work on the exercise ball is one of the most effective ways of building functional strength and core stability. By introducing the element of instability, working on the ball challenges your motor skills and improves body balance and coordination. J. Pilates original circles were made from tempered steel and padded wooden handles. Our Ultra Lite Circles are a lot more user friendly, we use them to strengthen and tone muscles in arms, legs, shoulders and hips and emphasize core strength. The foam roller provides sensory motor challenges on two planes and enhances balance reactions. 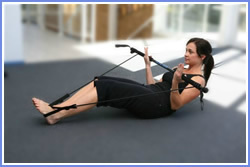 We can also use the roller to help with muscles re-education and improve muscle flexibility and spine mobility. Our most versatile piece of small equipment the ball can be deflated or inflated to cater for all levels of spine flexibility. We can adapt the use of the Chi Ball to mimic Swiss Ball, Roller and circle exercises and also use it for muscle release and relaxation techniques. We use the Aero Bar to improve core stability, proprioception, balance and strength. The bar with external resistance also gives us the advantage of duplicating some Reformer exercises.